If this book I'm holding here had been published in 1997 instead of 2007, I probably wouldn't have set out to write my own book on the history and cultural origins of qigong. I also probably wouldn't have failed in that endeavor and ended up putting my collection of writings up on the Internet in the form of a blog called "Weakness with a Twist”and you wouldn't be reading it! Qigong Fever: Body, Science, and Utopia in China , by David A. Palmer. Published by Columbia University Press, 356 pages. The book is a history of Qigong, which appropriately frames the subject as a political movement built around a body technology with religious characteristics, and scientific pretensions. It is a book which resists symmetrization. Never the less I'm going down that road. Qigong Fever tells a really shocking story of mass hysterical enthusiasm. The kind of popular insanity that can only happen in a world where 2+2=5 if the Party says it does! The state in essence banned religious devotion, magic tricks, spontaneous expression, deep emotion, and even self-respect. The Party claimed to be in favor of using science to save the world, but obviously science cannot be practiced in an environment where 2+2 might equal 5. It was from this skewed environment that qigong came to be capable of healing anything and everything. 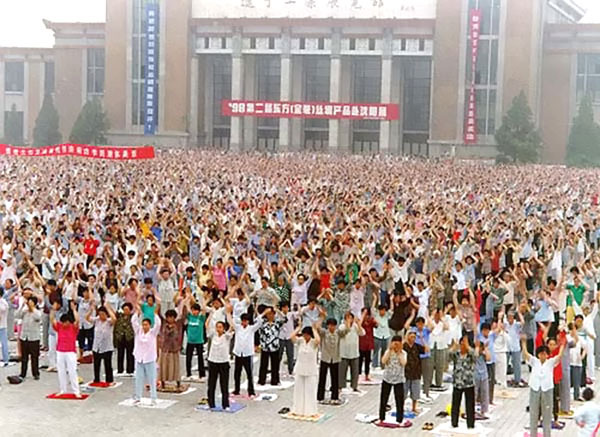 All over China otherwise ordinary people could see with their ears, control guided missiles with their minds, tell the future while balancing on eggsâ€”qigong became the source for the development of everything weird, magical, new age, charismatic, and psychic. That all this could happen in the name of science would already be beyond normal comprehension, but the Communist Party brought what would otherwise have been just weird and wacky to a fever pitch by issuing an order essentially forbidding skepticism. The title Qigong Fever refers to the explosion of interest and participation in qigong methods, research, charismatic religion, and a whole lot more that reached a peak in the decade from 1985 to 1996, after which the government cracked down on qigong people in general and particularly on the followers of the dangerously unbalanced Li Hongzhi, known collectively as Falungong. Palmer tasks himself with creating a historic record for a subject that is made up of seemingly limitless false claims and (even more challenging for the historian) partially false claims about its origins and functions. In addition he tackles problems as an anthropologist carefully milking the overlapping realms of scientism, charisma, national consciousness, repression, religious impulse, and shifting political networks into a frothy qi infused tonic. The political alliance that made the qigong movement possible eventually fell apart creating outlaws and refugees. The last chapter of the book deals specifically with the Falungong and its transformation from a qigong cult into an outlaw and exiled revolutionary utopian movement. The book has a lot of footnotes. Palmer draws on a wide array of original Chinese sources for historical material and makes good use of the history of ideas. His writing moves easily between telling the story, putting it in context, and bringing in other peoples ideas and research to convey the depth of his analysis. If you like this blog you'll like this book.